You know the routine - when an animal goes missing - we as a community do our best to look out for one another and find that animal! 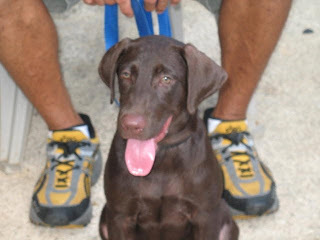 PAWS received an email today about Bruno, a chocolate lab that went missing yesterday. There is a chance that he decided to take a walk on his own and that he will return, but just in case - please keep your eyes open for Bruno! His family is horribly sick over his disappearance. For more information, please visit the PAWS blog at www.paws-saipan.blogspot.com. If you have any information on Bruno, please contact Willie at 483-9459 or Louisa at 483-8946. Alternatively, you may contact me at 286-0970. Thank you for being the eyes, ears, and heart of Saipan.